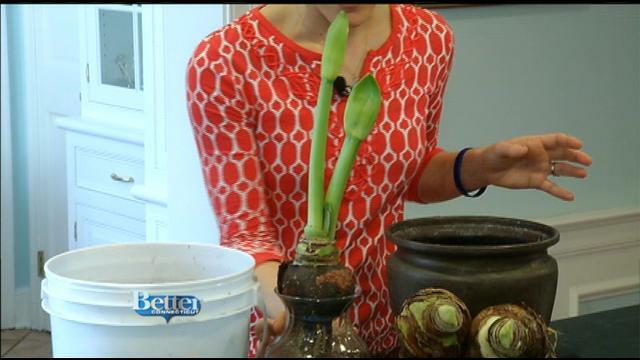 Amaryllis bulbs make for a fun and easy way to add some color and sophistication indoors. They are actually much less complicated to grow than most people think, especially if you follow my tips. Tip#3: Soak the bulb in water for 30 minutes before planting in soil. This hydrates the roots so they begin to grow quicker. Tip#4: Keep the planted bulb in a bright, sunny window and in a warmer room. They (like me) prefer temps closer to 70 degrees. Tip#5: Cut back the flower stalk as soon as the buds begin to fade. Tip#6: Enjoy the dramatic strappy leaves until spring and then add your Amaryllis bulb to a planter or the garden and watch it flower again outside!